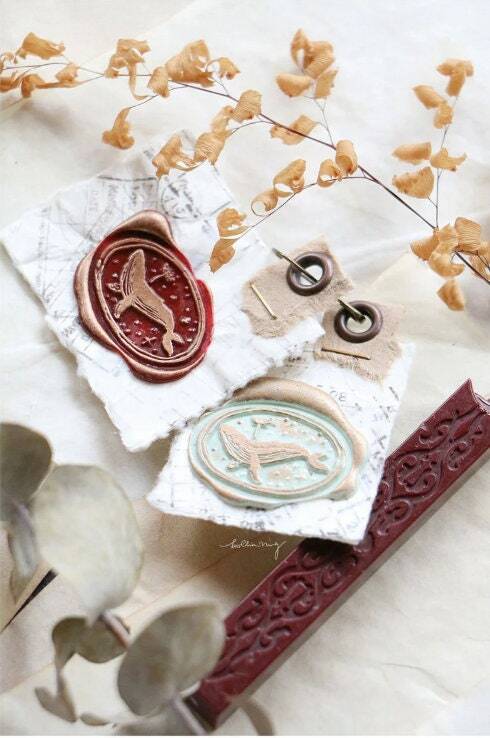 This is a wax seal stamp set consisting of a metal wax seal with wooden handle, 1 stick of sealing wax (randome color) and a canvas storage bag. Measures approximately 2 x 3cm in a whale design by artist Lin Chia Ning. This type of notebook is my very favorite in the world and I have not been able to find them anywhere in the past few years, so it was great to locate one from this shop. The transaction was great and i received it in perfect shape. really nice item. Would buy again. This package arrived quickly and in perfect order! I will use in my journal or on packages too! We accept PayPal, Credit Cards and Etsy gift cards. Please see below re: echecks. E-CHECKS- echecks usually take approx. 3-5+ business days to process. If you require your order quickly, please choose another method of payment. We sell items we love and therefore hope that you will love the item just as much, however, if there are any issues with your product, please contact us within 48 hours of receipt. If it is determined that a refund is in order, item must be returned in it's original and unused condition. Original postage will not be refunded and buyer is responsible for paying for shipment of the return item and reshipment of exchanged item(s) if applicable even if original item shipped for free. There will be no reshipment of the orders if it's shipped to the address on Etsy and it is incorrect. Our products are shipped using Canada Post however, they are shipped via a 3rd party shipping company to take advantage of bulk shipping rates to provide a better rate for you. When your item has shipped, you will receive a notice from the shop, but the shipping/tracking # will take another 24-48hrs to be posted to your account. This does not mean that your package isn't already on it's way to it's destination. Items usually shipped 2-5 BUSINESS days after confirmation of payment (holidays do not count) however this may vary depending on if item is a Pre Order or if the shop has specified extended shipping due to travel/inventory/etc. Please see shipping details for items ordered. PLEASE NOTE - when items are marked as shipped, it means they are shipping from Canada first and then will make it's way to our US shipping depot. Because the tracking # provided is for USPS, please note that it takes up to 24-48hrs for tracking # to be updated. ALL SHIPMENTS (WITH THE EXCEPTION OF CANADA) ship through USPS standard first class mail - INCLUDING International Shipments. Delivery can take any where from 3-7 days within the US. There is no insurance in the listed shipping rate, but if you wish to add a delivery option such as: insurance, certificate of mailing, Certified Mail, or Signature Confirmation - please send us a note with your transaction and we can bill it as a separate fee. International orders ship using USPS first-class international mail. Usually takes average of 9-15 business days after day of shipping but can take up to 30-45 business days due to delays in the receiving country's customs clearance. Please note that we will need to wait at least that long prior to investigating any packages that are feared lost. Please also familiarize yourself with your country's import rules re: customs/duties/VAT/import fees and taxes including import thresholds. Buyer is responsible for the payment of these fees if applicable. Please note it is not possible for us to mark an item as "gift" or with a lower merchandise total amount. If you have any questions, comments, or issues, please, please contact me first to discuss prior to leaving a neutral or negative feedback or paypal dispute. I enjoy communicating with my customers and will always try to reply to a message with 1-2 business days. Also, if there is something in the shop that you are looking for and can't find, feel free to drop me a line. It is always possible that I have it in stock but it has not been featured on Etsy yet. COLOURS: Please note that different cell phones, computers and monitors display colours differently. I will do my best to post photos that show the items in natural lighting conditions but the item color still may appear different from what is displayed on your monitor or phone. If you are looking for an exact color match on something please drop me a line and we can see what we can do.